Piazza San Carlo Turin is defined as the most beautiful, most representative and most glorious place in Turin. For many, Square San Carlo is the beating heart of the northern Italian city. It separates one of the main streets of Turin - Via Roma, in two. Via Roma starts from the Palace Square, where the Royal Palace in Turin is (Piazza Castello), passing through Piazza San Carlo , to reach Piazza Carlo Felice. Here are some of the best and most elegant boutiques in Turin. This part of the city over the centuries has several times changed its names - Piazza Reale, Piazza d'Armi, even bears the name of Napoleon, while the ruler was alive. Piazza San Carlo was built in the middle of the 17th century, as its architect was Carlo di Castellamonte (1642-1650 year). Since 1618 this part of Turin is dedicated to Carlo Borromeo. Piazza San Carlo retains its authentic appearance and atmosphere reminiscent of that of the 17 century. 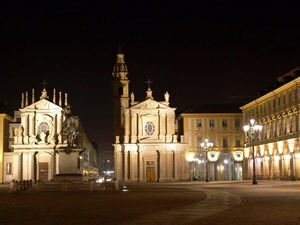 Today, San Carlo is the main parade and plaza in Turin. In the center of the piazza can be seen proudly the horse statue of Emanuele Filiberto, which is the work of master Carlo Marocchetti (1838). The statue recreates Filiberto astride a horse and brandishing a sword after the battle of San Quintino in 1557. This majestic sculpture is considered one of the most important and significant in Italy since the early 19 th century. Extensive part of the square of San Carlo in the south side is marked by the facades of two major buildings - the church Santa Cristina and the church of San Carlo. Among them, at address number 189 of the square can be seen the palace Solaro del Borgo, renamed Isnardi di Caraglio. Since 1839 this building in Piazza San Carlo is home to the National Philharmonic orchestra. The palace was reconstructed thoroughly in the 18th century by Benedetto Alfieri. Later Solaro del Borgo is repaired by Giovanni Battista Borra and today along it, can be seen lovely decoration of 18th century in all rooms. Concert hall was decorated by Giuseppe Maria Talucchi (1839-1840). Piazza San Carlo could not be the same without the same name as emblematic cafes, opened back in 1842, and cafeteria Turin. Here since 1836 has continuously is a boutique, Fratelli Stratta. In 2004 the final was completed with the conversion of San Carlo into a pedestrian zone. As a result, walkways were constructed, and parking spaces for cars have been removed. Instead, a square is built underground, with a capacity of 380 parking spaces.